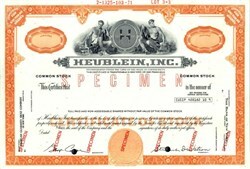 Beautiful engraved specimen stock certificate from the Heublein, Inc printed in 1971. This historic document was printed by American Bank Note Company and has an ornate border around it with a vignette of two allegorical men flanking the company's logo. This item has the printed signatures of the Company's President and Secretary and is over 44 years old. In 1982, the R. J. Reynolds Tobacco Company acquired Heublein Inc. for $1.4 billion. In the corporate reorganizations that followed the merger of R.J. Reynolds and Nabisco, the resulting corporation, RJR Nabisco, began selling off many of Heublein's assets. RJR Nabisco sold Kentucky Fried Chicken to Pepsico in 1986 and sold the Heublein division and its alcoholic beverage brands to Grand Metropolitan in 1987. In 1995, RJ Reynolds sold the Ortega Mexican foods product line.